I thought I’d give you a little sneaky peek of It Cosmetics Bye Bye Makeup 3-in-1 Makeup Melting Cleansing Balm. Now I don’t have a price as of yet for 3-in-1 Makeup Melting Cleansing Balm because there’s a little something happening with it next week I can’t yet share but I promise it’ll be worth the wait. So, at the moment my go to for cleansing is Farmacy Clear Bloom Makeup Glideaway Cleansing Oil because everything and anything else I try using is making my skin super tight and dry. I can happily say that It Cosmetics 3-in-1 Makeup Melting Cleansing Balm is practically perfect in every way, kinda like Mary Poppins. If you use products like Clinique Take the Day Off Cleansing Balm, E.L.F. Hydrating Gel Melt Cleanser, and Banila Co Clean It Zero, you’re likely already very familiar with the texture and consistency of It Cosmetics 3-in-1 Makeup Melting Cleansing Balm. This is a solid balm cleanser with a thick, squishy yet creamy consistency that can be applied all over dry skin, massaged in, and emulsified using water to remove makeup, dirt, oil, and grime! I can’t express how much I love this stuff. It’s far better than the Clinique, E.L.F., or Banila Co formula as it not only is it considerably more moisturizing but it all the time I’ve been using it I never once felt tight or dry after use. Clinique’s formula is great but my skin has been so dry lately even that makes me tight after use! I had absolutely no problems with It Cosmetics’ formula! This does have a very bright, citrus-y fragrance which I found pleasant but won’t be great for sensitive users. The scent is pretty much the same that the new It Cosmetics Confidence Cream has. This formula works a lot like cleansing oil. The balm is thick but once you start massaging it onto your dry skin it breaks down and becomes oily. The directions suggest leaving it on 60 seconds, sort of like a mask, before either tissuing it off or rinsing it. Personally I prefer to rinse with lukewarm water as this breaks it down more easily. It emulsifies and turns milky just like a cleansing oil and rinses clean away. It actually gives a very deep clean! I didn’t even feel the need to double cleanse after using it. It whisked away my makeup, broke down any remaining mascara I had on, and left my skin fresh and clean without leaving behind tightness or a film! It Cosmetics 3-in-1 Makeup Melting Cleansing Balm will be available soon on QVC.com. I’ll share more info with you on the launch shortly. When will you be able to share the It Cosmetics TSV with us? I can’t share it until next week as I am embargoed but will share it as soon as I can! I also need this. This looks like another item that is part of QVC it cosmetic today special later this month!! Are you going to share the it cosmetics tsv with us soon? This sounds amazing!! 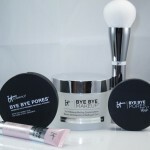 I love It Cosmetics as a brand and some of their products are staples for me. Sadly they’re very hard to get outside the US. I live in Germany and beautylish is the only ‘easy’ source for me to get my hands on It Cosmetics products, but they don’t stock all the range and mostly only make up items. Aw! 🙁 I totally understand lemming something from abroad. Hopefully! I’ll keep my fingers crossed for you! It’s great, Denise! 🙂 I think you’ll like! I’ve never been sure how to use the balms and cleansing oils, etc. After this do you use another cleanser or is this it? My skin is so dry right now this is very tempting. Do you typically double cleanse? If not there’s no need to follow up with another cleanser! Any snail stuff in it? Yes I know I probably put gross things on my face worse than snail slime, but I can’t get past this. Also what exactly does embargoed mean for a blogger? When I worked for a bookstore, we had streetdates (can’t sell until that day) that couldn’t be broken or the publisher would not send us the new releases the same day as other retailers. We did a window display with a book that had a sign stating “coming soon”. We had to take it down even though we were not selling it until that date. Look forward to trying this. Currently I have Emma Hardie (my precioussssss) & Banila Co.’s Zero Purity version in heavy rotation. Along with assorted others. For some reason, I love buying cleansers these days. PS. Thanks for posting ingredients,it really helps. OH Varya you fancy cheeky little money! I had the pleasure of using the Emma Hardie Moringa Cleansing Balm when my friend Libby was visiting from London and she had it tucked up in her bag like a bar of gold 😀 Lovely stuff it is but damn expensive 🙂 Oh my pleasure! Sadly, I forgot to do so here but promise to update the post shortly with ingreds 🙂 xoxoxoxoxox! <3! MUSE, I went on a first date last night (went to see 10 Cloverfield Ln) and he said he didn’t like Captain America/Avengers, X-men, or Batman. I tried the Clinique balm several years ago and I found that if I did not double cleanse, it made my face break out. If this emulsifies in water and rinses off completely it might work, but anything that has to be tissued off is a problem for me. Either/or says the directions but personally I don’t like tissuing off anything! So I rinse, it rinsed completely off for me, no evil film or tackiness! Although this has a lot of fragrance, Jeri, so just keep that in mind in case fragrance is an issue for you! Where can I buy this? I tried to find a makeup cleanser for my skin although i don’t make up often! Is it used for oil skin? QVC has it exclusively at the moment. It is absolutely the BEST i have used. It does not irritate the eyes either. I normally dont have to double cleanse but i did apply it, and then let it sit for a minute, then used my clarisonic before rincing with warm water… BEST skin routine yet! Okay, thanks. I’ll probably get some before I run out of the Miracle Glow, which is awesome by the way. At least I can return it to Ulta if I don’t like it. I have tried quite a few of IT products since I attended the QVC Beauty Bash a few years ago, and IT was one of the vendors. There products are quite great I really don’t think you’ll be disappointed. Let me know what you think if you do try? It will probably be a month before I need to buy since I still have plenty of Miracle Glow. I’ve been wondering if there was a less expensive product similar to the Miracle Glow, so I’m hoping the IT brand will be close. The only IT products I haven’t loved are the CC Veil and the white finishing powder. The CC veil is just too thin and neither product wears well on me. Oh CC Veil, I have to admit, is my HG 🙂 I love it! You are much younger than me. The CC Veil is so thin that it slides into fine lines, making them look deeper than they are. I used to like primers to help with that, but can’t wear them now due to sensitivity to silicones. I tried Model in a Bottle, which seemed to hold the makeup in place a little longer. However, after a few hours, it gave my face a cakey or blotchy appearance. One thing I love is Mally Face Defender. I dab it on over my makeup with the sponge and it gives my skin a poreless appearance, making little flaws disappear. I don’t have as much trouble with the silicone in it since I put it on top of my makeup. oh no really? 🙁 Sorry! I love Mally Face Defender as well! Such great stuff 🙂 I did a post a while ago, somewhere deep in the archives, about changes in my skin/under my eyes particularly that happened when I got older but I can’t recall the name of the post. I’ll try to find it. Lots of discussion happened in that post about changes your skin goes through as you age! I don’t yet have fine lines my face but my eyes have changed so dramatically through the years. It’s kinda like you have to adapt to doing your makeup an entirely different way as the changes occur! I totally understand! I tried the It melting balm and have to say I don’t love it. For the last couple of months I’ve been using Charlotte Tilbury Miracle Glow cleansing balm, and the IT balm doesn’t come close. The IT cleanser has the consistency of Crisco; I was expecting something softer like the Tilbury product. It did a good job of removing makeup, but the strong orange fragrance was overwhelming, just as you said it would be for sensitive people. I removed the product with a warm rag. After drying, my face felt tight and dry, not hydrated like it does with the Tilbury cleanser. So I just ordered another jar of Charlotte Tilbury Miracle Glow from Nordstrom. It costs more but is worth it. Now what do I do with the IT cleanser??? I only used it twice with a cosmetic spatula. And now my face is broken out from the strong ingredients. Oh no sorry Teresa 🙁 I had a good experience with it but I agree the fragrance is way too strong for sensitive users 🙁 Sorry it broke you out!!!!! I have to agree with Teresa that the Charlotte Tilbury Multi Glow Cleansing Balm is fantastic for dry skin and gets makeup and eye makeup off without stripping skin. It has a different consistency than the It Cosmetics cleansing balm or the Clinique Take the Day Off Balm and the fragrance is far more subtle. I find that the It Cosmetics cleansing balm is slightly more emollient than the Clinique Take The Day Off Balm and like Muse, I agree that between both of them the It Cosmetics cleansing balm is not as drying as the Clinique product. If you have dry skin and want a reliable make up remover, the Charlotte Tilbury cleansing balm is more emollient and while pricey, has a more subtle fragrance than the It Cosmetics balm which can be a problem for people who are allergic to anything with citrus oils in them. I LOVE IT Cosmetics 3-in-1 Makeup Melting Cleansing Balm! I have used it with and without my Clarisonic SmartProfile and without and you just can’t go wrong with this wonderful stuff. I use it as my nighttime cleanser now and use my TACHA Oil and Enzyme Exfoliated system in the morning! YES with the clarisonic is awesome!!! !